We now have over 20,000 image links from free full text journals, websites, the AFIP Fascicle third series, or contributed images.� Click here to learn how to contribute images.� We are currently updating half of the Soft Tissue Chapter, with information from the textbooks by Rosai and Sternberg, the WHO Soft Tissue Monograph, the AFIP Soft Tissue Fascicle third series, major pathology journals and other relevant literature.� We hope to have it completed soon.� Don�t forget to fill out our brief Survey (click Here or at the bottom of the Home Page) by 30 April 2008 to help us improve our website and qualify for our drawing of two prizes of $75. How can you easily support our website?� Check our Buyer�s Guide (click here), and if one of your vendors is not advertising with us, ask their sales representative why not.� The cost is only $2000 per year for the Buyer�s Guide.� We can provide you with a contact email address for any business. We thank Dr. Anshu Jain and Professor Veena Maheshwari in Aligarh, Uttarpradesh (India) for contributing this case. To contribute a Case of the Week, email NatPernick@Hotmail.com with the clinical history, your diagnosis and microscopic images in JPG, GIF or TIFF format (send as attachments, we will shrink if necessary).� Please include any other images (gross, immunostains, etc.) that may be helpful or interesting.� We will write the discussion (unless you want to), list you as the contributor, and send you $35 (US dollars) for your time after we send out the case.� Please only send cases with high quality images and a diagnosis that is somewhat unusual (or a case with unusual features). A 60 year old man presented with a progressive swelling in the left eyelid for two months (clinical photo). �He was a non-pork eater, and belonged to a low socioeconomic group. �There was no history of headache or seizures.� His left eyelid showed a 1.2 x 0.8 cm swelling.� The physical exam was otherwise normal, with no swellings elsewhere.� The eyelid lesion was excised. Grossly, the mass was 1.5 x 1.0 cm, and sectioning revealed two cystic spaces with a single solid focus on the inner surface. 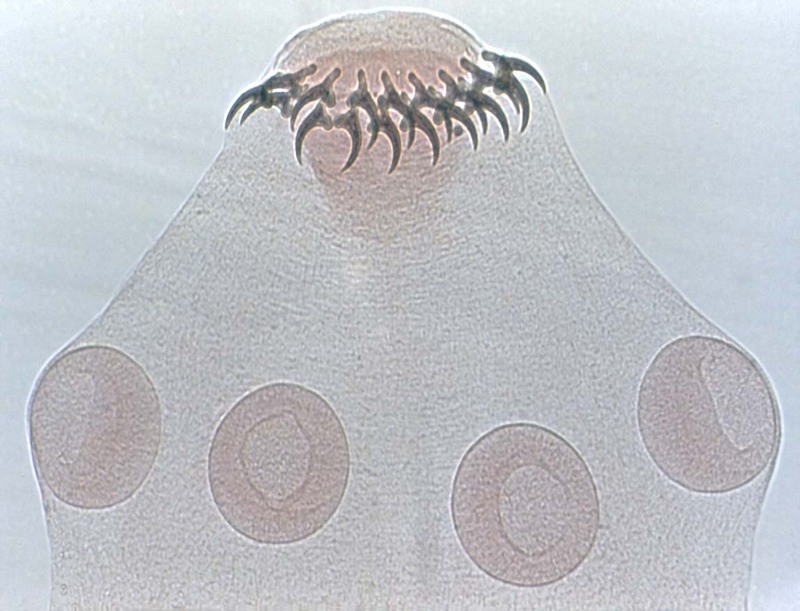 Microscopic examination demonstrated the undulating laminated membranous wall of a cysticercus (the larvae of a tapeworm), with an associated inflammatory infiltrate and fibrosis (left side of image #1).� The scolex (knoblike anterior hooked end that serves as an organ of attachment to the host) is present in image #2 (see also drawing). Cysticercosis is a systemic illness due to dissemination of the larval form of the pork tapeworm, Taenia solium. �Encystment of larvae can occur in almost any tissue, including skin, skeletal muscle, heart, CNS (neurocysticercosis) and eye.� Involvement of the eyelid is rare, with few reported cases (Arch Ophthalmol 1978;96:1255, Indian J Med Microbiol. 2007;25:214). Cystercercosis affects 50 million people worldwide, and is endemic in Mexico and South America, sub-Saharan Africa, India and East Asia.� It is the most common cause worldwide of parasitic infestation of the CNS, and a leading cause of seizures.� In the US, there are an estimated 1000 annual new cases, with an increasing incidence due to immigration from and travel to endemic areas, and improved diagnosis through imaging and serology. Treatment is with albendazole, an antihelminth.